Being in Southern California, even with occasional cold days, my chrysanthemums don’t know when to stop blooming. They start around late October but there are always some stragglers that manage to put out a few more blooms unless I cut them back – hard – in December. Our oak dining room table is becoming one of my favorite places for a still life setup. You’ve seen it in the eggshells and in the black and white study of the pear/grape and bottle … and now the dining room window provides the rimlight for these blooms, casually tossed in a glazed ceramic vase we picked up a few years ago at a garage sale. 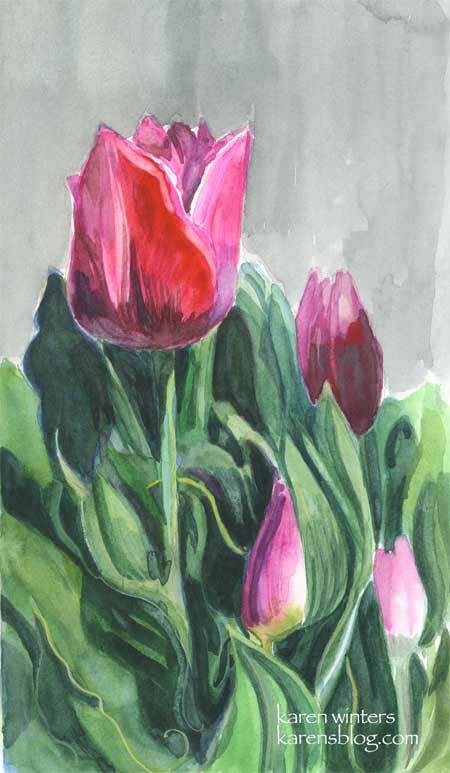 This was yesterday’s study in our watercolor class. 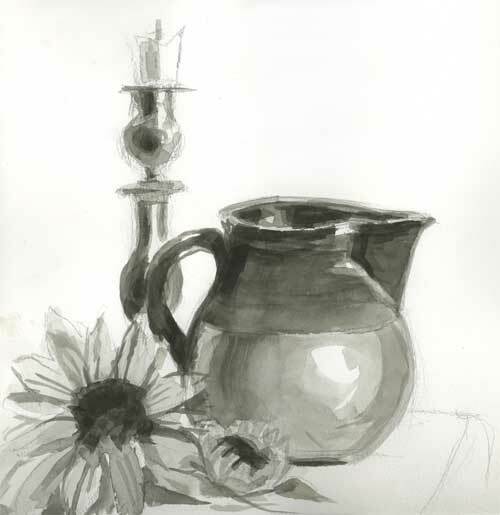 The objective was to paint the still life arrangement using a split complement color scheme. I did … using a red violet, a red orange and green. But the only mixable background color ended up being brown … Not exactly what I had in mind, so when I got it home I glazed it with blue. Next time, I’ll pick other colors to experiment with and maybe save the green red split complement for a landscape where brown would be a welcome consequence. Now, I have to confess the flowers were some wispy looking orange bougainvilleas, but we were encouraged to paint shapes, not the individual blossoms, so mine ended up looking more like roses. And … there wasn’t another fallen blossom at the base of the glass vase. I threw that in because I thought it needed something for balance. And when I got it home, I cropped it (in the computer) and like it better than seeing the whole thing. I like the suggestion that there is more than just what we see. I read someone’s email recently in which the person sounded a little apologetic for being a beginner. How I wish I could change that person’s mind about that belief. Being a beginner is a wonderful thing because it means we’re still open to change, learning, growth and new discoveries. There’s no shame in being a beginner, and we are all beginners at something. My teacher is a master watercolorist but a real beginner at computers. Our veterinarian is an incredibly skilled doctor but a beginner at welding. My father was a master welder but a beginner at metal sculpting. I know superb sculptors who are beginners at oil painting. 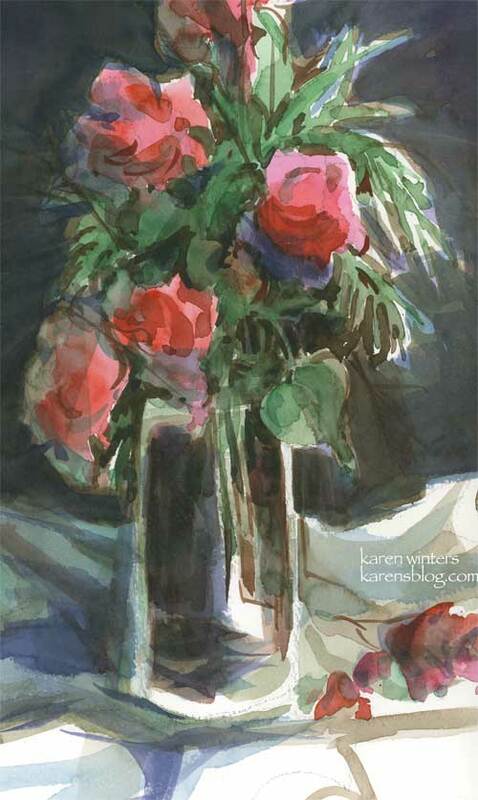 And outstanding oil painters who are beginners at watercolor. How sad it is to apologize for being a beginner at anything. It’s a good place to be – and may we all continue to be beginners at something as long as we live. My dear husband surprised me with a beautiful pot of tulips for Valentine’s Day. Now that he is participating so much with me in my art activities, he has developed an quite an eye for things I would like to paint. I have always loved tulips, and carried them in my wedding bouquet, but being able to paint them just doubles the enjoyment. OK, a few art notes about this. After I painted it I realized that it is really a painting made up of just one color and its complement – magenta and yellow green. The gray for the background is something I’ve heard described as “palette gray” – you mix together the various bits of red, maroon, dark green and yellow green and it produces a soft neutral that works well with the bright colors. On another note … I’ve gotten quite a few emails that people are unable to leave comments when they try – and last night I was getting database error messages from my host when I tried to publish. Please drop me a line and let me know if you’ve run into the same problem, and what system, browser you’re using. Something is afoot but I’m not quite sure what it is. Thanks! 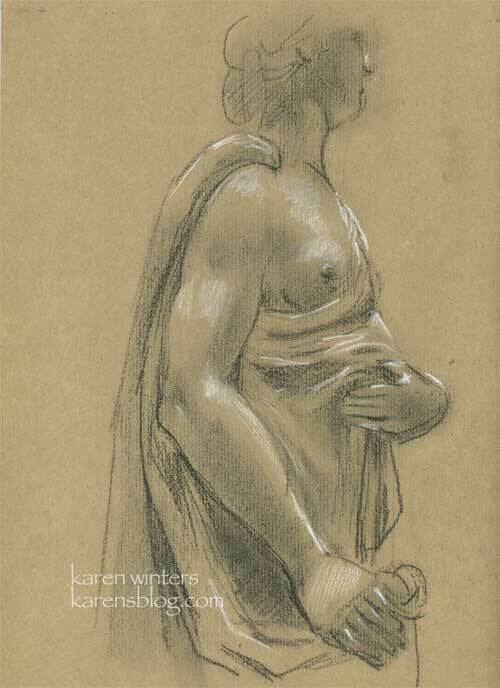 Today’s daily painting is actually a drawing done yesterday in one of the galleries at the Getty Museum in Los Angeles – the one in the Sepulveda pass, not the villa. This is another view of Venus a marble by Joseph Nollekens. 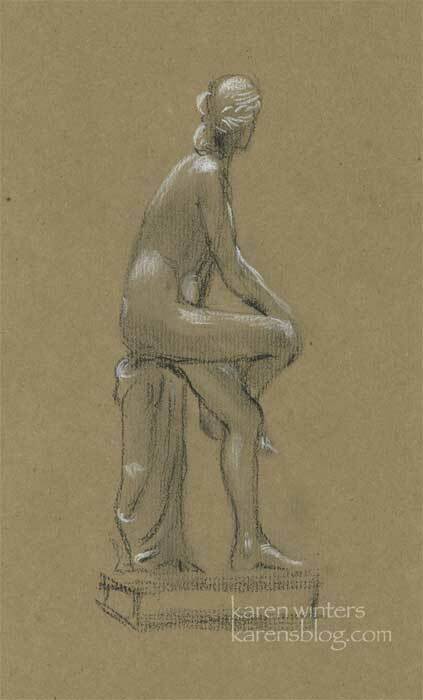 So as not to block the view of the visitors, I sat along a wall to the left of the statue and quietly drew using charcoal and white chalk on toned paper. The light was coming in softly from the skylight, which made the roundness easy to visualize. 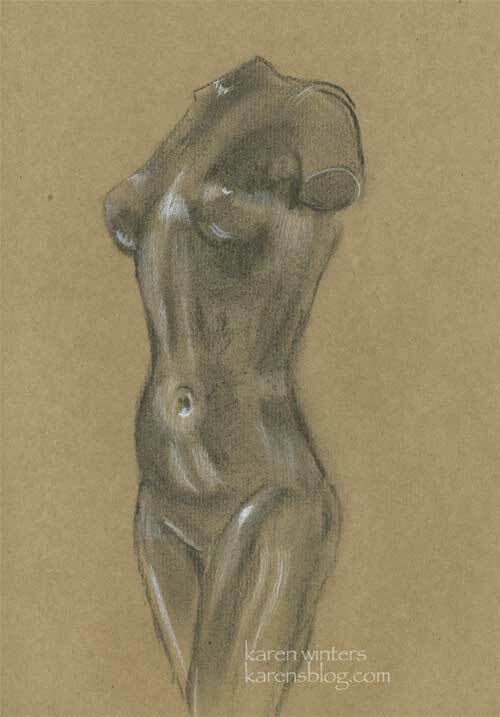 I drew five of six sculptures while I was there … slowly, and with a lot of visual measuring of proportions. I liked working on the toned paper because I didn’t have to create all the midtones to suggest a feeling of volume. I will be posting other drawings this week and probably doing more studies in preparation for taking a life drawing class when my watercolor class ends. “The Stories They’d Tell” – 5 1/8″ x 7″ – oil on canvas mounted on masonite. Among the homeliest objects in our home are this old pair of scissors and a wooden “Clarks” spool. Both are probably from the 40s or 50s, judging from the look of them. Occasionally we’ll go to estate sales in our area, and inevitably there is a sewing basket with old scissors, spools and papers of pins. I like to think about their years of service and all the jobs they’ve done – a hem raised or lowered to suit the fashion of the time … a collar taken off and reversed to save buying a new shirt during the Great Depression … a Halloween costume made. Perhaps this thread and scissors patched up a hole in Santa’s jacket before it was packed away for another year. 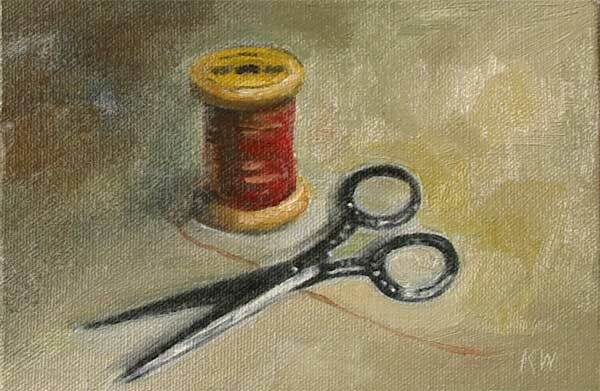 What stories would your scissors tell, years from now? 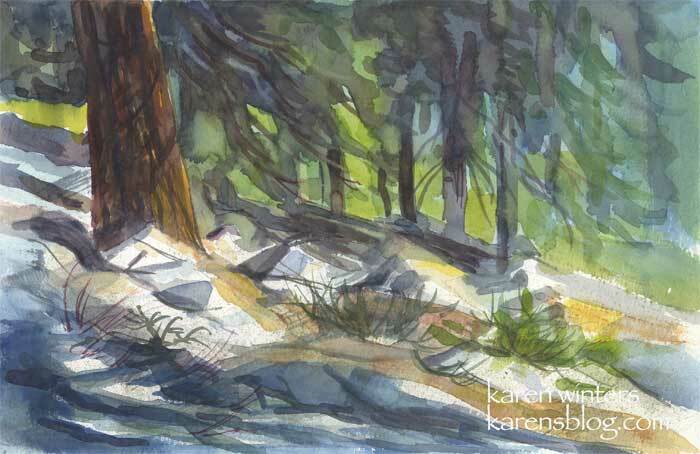 “Pine Hillside” 7″ x 10.5″ – Watercolor on paper – A scene from the Angeles Crest Forest, about an hour from our house, up in the mountains. Time for an update. The past few days have been more than a little hectic. My aunt went back to the emergency room again on Wednesday, but this time did not have to stay overnight. So we’re hoping that a solution will be identified soon. I have my hunches, we’ll see what it leads to. I’ve been reading an older book by Edgar Whitney that I’ve had on my shelf for a very long time. It’s out of print now but it still has some of the best advice on watercolor I’ve seen. Whitney’s approach was based strongly on designing good pictures and not simply painting what one sees, a topic that comes up a lot in various discussion boards I participate in. Each of these principles can be broken down into design components such as dominance of a particular color, value, shape, line, color, size and so forth. This is basic stuff, certainly, but it’s so well explained and demonstrated that I could probably read it every day and still find more to learn. 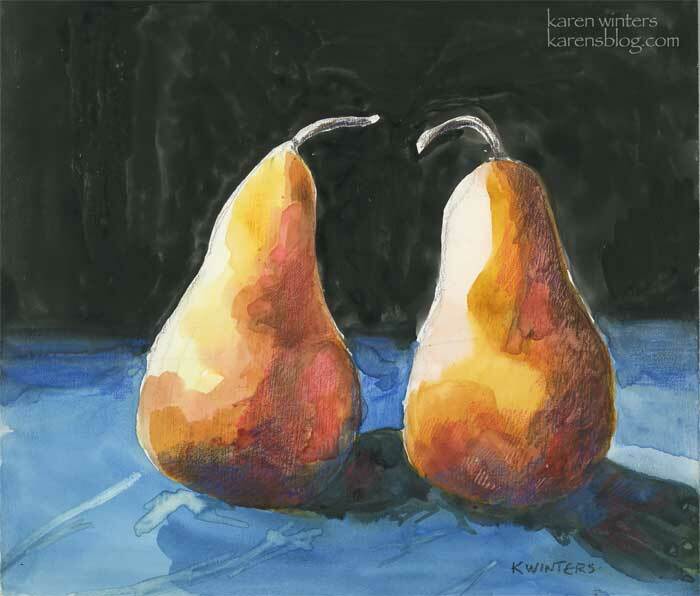 And the concepts, of course, apply to any painting, not just watercolor. So much to learn, so little time. Sigh. What a week – busy on all fronts, from doing an illustration project for a client (oil painting to be posted soon) to a sudden out of town business trip. 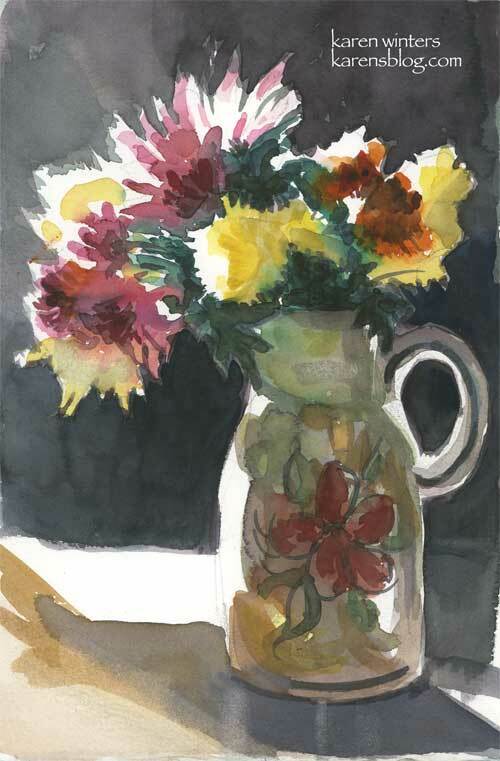 The night before my Saturday watercolor class I had barely enough time to set up a quick still life to paint from. I am so used to painting in color that I am definitely out of my comfort zone working in black and white. No matter, I’m happy to do it. Next week some of us who are a bit more experienced are assigned to do another one of these studies and bring it in matted, along with several practice landscapes.